The 1908 Salon d’Automne in Paris is a watershed moment in Finnish art history. 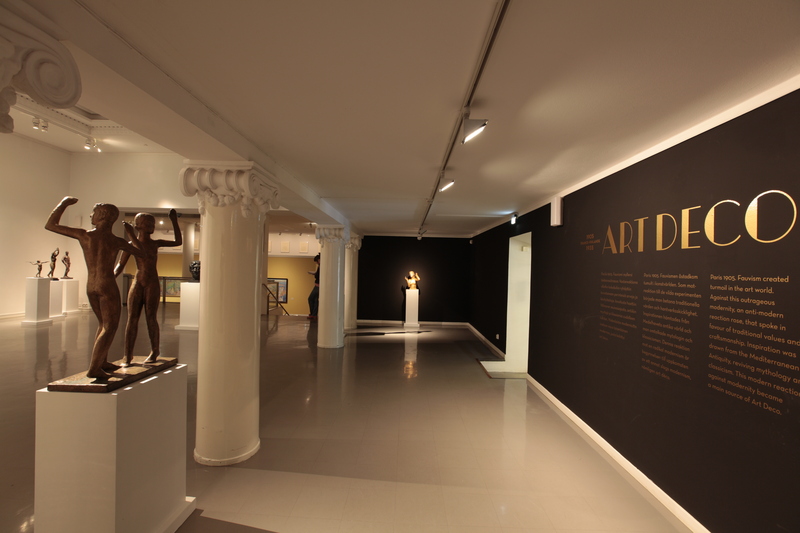 The Finnish exhibition received scathing reviews in the Parisian Press, which subsequently led to Finnish artists re-evaluating their links to the new artistic currents in French painting. Although Fauvism – Colour Expressionism – was widely discussed, Finnish artists were excited by Maurice Denis whose Story of Psyche was exhibited in the same Salon d’Automne. Juho Rissanen moved to Saint-Germain-en-Laye, a western suburb of Paris, to study monumental painting (1911-1914 and 1920-1925) under Maurice Denis. In Saint-Germain-en-Laye, Rissanen worked on a series of paintings for the Hackman mansion in Vyborg. For the artists whose careers started in the late 19th century, Pierre Puvis de Chavannes was a central figure. His lead was followed by artists who wanted to approach antiquity from a non-academic angle. Puvis de Chavannes’ draped and timeless figures offered an inexhaustible source of inspiration for Paul Gauguin as well as Maurice Denis. During the first decades of the 20th century, Eero Järnefelt produced a series of ambitious nudes. Järnefelt played a key role in introducing Classicism to Finland through his work as an artist, writer and teacher as well as a board member deciding on acquisitions for the national collections. Venny Soldan-Brofeldt became interested in Classicism through her friend, the dancer Maggie Gripenberg. Soldan-Brofeldt married mythological themes with views of the Finnish archipelago, and cast Maggie as Aphrodite in The Judgment of Paris. Seeking inspiration from Ancient Greece, the American dancer Isadora Duncan broke away from classical ballet to develop so-called free dance. In Paris, Isadora Duncan was celebrated as the embodiment of a Greek goddess. Artists such as Antoine Bourdelle, Maurice Denis and Jules Grandjouan frequently depicted her, thus introducing her into the fine arts. Maggie Gripenberg received similar acclaims and attention from artists when she introduced Duncan’s free dance to a Finnish audience. She instigated a new interest in antiquity and classical themes on the Finnish art scene. The influence of Isadora Duncan in Finland can also be traced to Ellen Thesleff. The decorations of Théâtre des Champs-Elysées by Maurice Denis are emblems of Art Deco. His work had a huge influence on Finnish artist Yrjö Ollila. In the 1920s, Denis’ friend Aurélien Lugné-Poë asked Ollila to decorate Théâtre de l’Oeuvre in Paris. Ollila maintained close links to the world of theatre even after moving back to Helsinki, where he worked as a set designer and won the competition for the decoration of the ceiling in the Finnish National Theatre. The decorative paintings were completed posthumously. A re-evaluation of the classical heritage took place in theatres all over Europe. Fresh perspectives on classical plays by Sophocles, Antigone in particular, were discovered. The Greek tragedies became topical and accessible to Finnish audiences through new translations into Swedish by Emil Zilliacus. In France, Jean Cocteau developed a new artistic vocabulary inspired by antiquity. His version of Antigone was staged with costume designs by Coco Chanel, set designs by Pablo Picasso and music by Arthur Honegger. In the same year Väinö Raitio composed his Antigone Trilogy, op. 23, an outstanding modernist orchestral piece. Galuchat (leather made from shark skin), ivory and precious woods were used by the designer Clément Mère for the furniture of the exquisite Parisian boudoir of Baroness Nelly de Rothschild, partly exhibited here. The delicate pastel colours were typical of early Art Deco interiors, and echoed the palette of Maurice Denis. Interior designers created total works of art and employed artists who influenced the outcome considerably. The Art Deco era saw a revival of the Faubourg Saint-Antoine workshops in Paris where cabinets were made following traditions dating from the 18th century. Sèvres had manufactured porcelain in collaboration with artists since the 18th century. The factory houses a historical collection of ceramics that has been a rich source of inspiration for many artists. The French ceramist Jean Mayodon was renowned for his vases decorated with classical friezes of animals and figures. In Atelier Lachenal in Paris, Finnish ceramist Greta-Lisa Jäderholm-Snellman produced a series of highly original Art Deco ceramics with a strong turquoise glaze. Jäderholm-Snellman was also a skilled graphic designer, e.g. postcards. Garlands and mythological figures were part of Art Deco. In Finnish glass these classical motifs appeared in engravings that played with light and shadow. Small-scale sculptures were popular interior design features. The subject matter was often an elegant lady posing as a goddess, an allegorical figure or a jolly modern woman of the roaring twenties. Manufacture de Sèvres produced huge quantities of Art Deco statuettes in bisque porcelain. In Finland, Eva Gyldén was a master of the statuette. Her limited production is not well-known, yet the quality of her work is astounding. Her faience sculptures, innovatively stylized, with elegant female figures are among the finest in Finnish Art Deco. Eva Gyldén’s cameos are a chapter in themselves. From the 1910s to the 1950s, Gyldén carved skilfully in mussel shells developing a world of her own; a world inhabited by slender nudes immersed in an imaginary classical dreamscape. The leading interior designer of Finnish Art Deco, Arttu Brummer designed a set of golden furniture for the Atlas Bank on Mikonkatu, Helsinki. The furniture entered Amos Anderson’s private collection after the bank closed down in 1929. With its spectacular carved figures, twisted columns and imaginative capitals, Brummer stamped his special mark on this set of furniture and invented a most original form of exotic classicism. The highest achievement of the period in Finland is undoubtedly the Parliament building, a total work of art imbued with Art Deco classicism. All the major artists, sculptors and designers of the 1920s worked on furnishing and decorating the Parliament building under watchful eye of architect J.S. Sirén. The project included numerous competitions for works of art. The overall quality of the entries was high, which is evident in Yrjö Ollila’s and Carl Wilhelms’ contributions. The reconstruction of a Parisian Art Deco bedroom is based on a set of furniture designed by Jules Leleu in 1923–1925 for Gonzalo Zaldumbide, the then Ambassador of Ecuador to France. In addition to a bed, bureau and mirror, the ensemble included a carpet designed by Ivan Da Silva Bruhns. The ivory bouquets that embellish the furniture are the work of Paule Leleu, daughter of Jules Leleu. The original bed which has disappeared is here replaced by a similar bed designed by Leleu for Mrs Chenard, the wife of a car manufacturer. The bed has been dressed with Art Deco bed linen generously provided by D. Porthault from their heritage collection. Clean geometrical forms and strong colour contrasts are typical features of the Art Deco style of the 1930s. Luxurious French transatlantic ocean liners were like adverts for Art Déco glamour. Raymond Subes, one of the most gifted French ironworkers of the 20th century, is here represented with theatrical iron chairs. Edouard Bénédictus became famous for his textile and wallpaper designs with their exuberant patterns, geometrical lines and opulent colour schemes. Finnish Art Deco painter Nikolai Kaario is an unexpected find; blending various international Art Deco themes into an exciting mix. After the massive destructions of the Great War, the Church worked actively for the moral and architectural reconstruction of Europe. Artists took a major part in creating a new aesthetic that suited religious purposes. Maurice Denis founded the workshop Les Ateliers d’Art sacré, to answer the artistic needs of the Catholic Church in France. Amos Anderson’s interest in Roman Catholic spirituality inspired him to build a private chapel in his house. The organ was decorated by the painter Henry Ericsson, who was also involved in the competition for stained glass for the Turku Cathedral, also sponsored by Amos Anderson. Henry Ericsson designed exquisite silverware for the 1929 Barcelona World Fair. A beaker that was presented to the King of Spain, was later acquired by a Finnish collector. The ecclesiastic items found their way to the Paavalin kirkko (St. Paul’s Church) in Helsinki.